These fun sand activities and books can be easily added to your beach or ocean theme, your summer camp curriculum, or done at home for some summer fun! Spread some sand on the black paper. Spread it thin enough to see individual grains of sand. 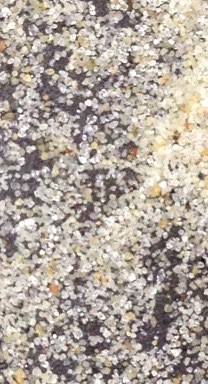 Look at the sand through the magnifying glass or the magnifying glass app on an iphone. At first glance, sand may look like it is all one color. Notice the different colors, shapes, and sizes of the sand under the magnifying glass. North American sand consists mostly of quartz. If you notice any small, jewel-like grains of sand they are most likely pieces of broken glass that have been smoothed by the waves and sand. Place a small pile of sand on the black paper. Drop a few drops of vinegar onto the sand and observe what happens. If you observe tiny bubbles in the sand or bubbling and popping sounds when you add vinegar, it means the grains of sand were once part of a living being such as coral, shells, or bone. The acid of the vinegar reacts with the calcium carbonate in the grains of sand which creates CO2 bubbles as it dissolves. 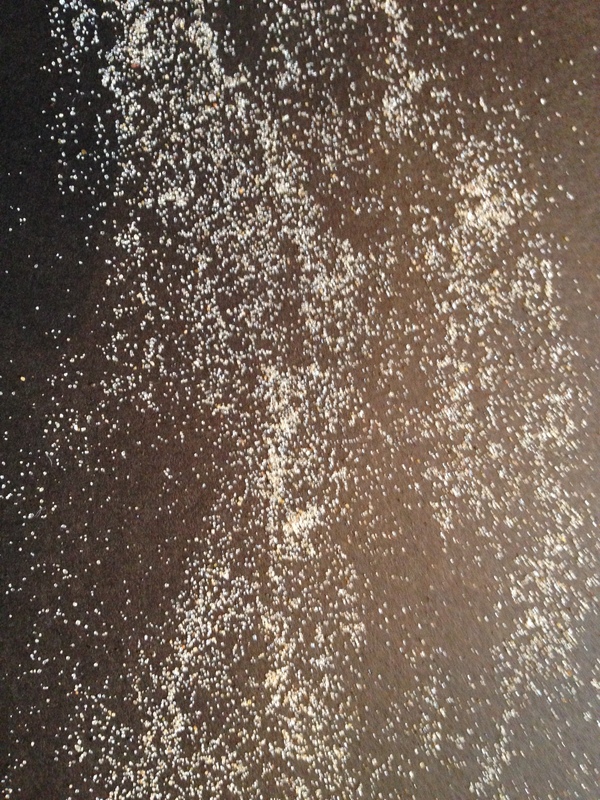 Here is a video of what happened when we added the vinegar to our beach sand. You can see and hear the bubbling action! In this experiment you will create “magic sand” that does not get wet when added to water! Place some sand in a container. Spray the sand with a water repellent spray or Scotch Guard. Shake the container and spray sand again. Repeat this process 5-6 times. Allow the sand to dry. Dry time depends on the amount of sand used. The sand will now be waterproof! Moon sand is a fun alternative to play dough. It can be molded and shaped as desired and is great for sensory play! This link provides several easy ways to make moon sand with simple ingredients (sand and cornstarch, flour and baby oil, or cornstarch and vegetable oil). If you need to purchase play sand it can be found on Amazon or any local store such as WalMart. Can’t make it to the beach? No problem! This sand dough can be molded into sand castles or just about anything young children can imagine. It’s also great for tracing letters in the sand. Click here for a sand dough recipe from education.com that only requires 3 ingredients (sifted sand, cornstarch, and hot water). Kids love playing with sand play dough and it is easy to make! To make sand play dough simply mix together 2 cups of flour, 1 cup of warm water, 1 Tbsp oil, and 1 cup of sand. If the dough is too dry and crumbly, add more oil and water. If the dough is too sticky, add more flour. Place a small amount on students’ desks or place it in a center along with some sea shells or beach toys. Every year during our end of the year carnival and during our summer camp program we would have a sand art station. The children always loved it! Making your own colored sand is simple. I would always use powdered tempera paint to color the sand, however I found this website that offers multiple ways to color your own sand. If you are in a time crunch and can’t make your own colored sand it is available to purchase. Children can make their own sand art creations by filling baby food jars or any small jar, small water bottles, or any plastic containers. You can also have children create simple sand pictures. First they draw a simple picture. Then, they paint it with glue and sprinkle colored sand over the glue. I found this adorable sand clay keepsake idea on The Imagination Tree! Sand can also be used for learning fun! Bury letters, shapes, numbers, etc. in the sand and have youngsters dig them up and name them. Your students or children will really “dig” this fun hands-on activity for learning the letter C! This activity can be done in your sand table, in a tub of sand, or on a cookie sheet filled with sand. Find the instructions and free printable clam pattern here. Children love dinosaurs and they love pretending to be little paleontologists! Copy a dinosaur pattern such as the one below onto tag board or poster board. Cut it into pieces and bury the “bones” in the sand. Give students a paintbrush and allow them to carefully dig for dinosaur bones. Once all the bones are found, put the dinosaur back together. Another fun learning activity is to dig for “D” dog bones in the sand. Cut out some dog bones and label some with letter “D” and some with other letters of the alphabet. Bury the bones in the sand. Have the students pretend to be dogs and dig up the bones. They must dig until they find a letter D bone. You can also make a simple dog puppet and pretend that Danny Doggy needs their help in digging up his dog bones. His bones have letter D on them. When rocked back and forth, the water and oil mixture simulates waves. They make wonderful and calming sensory bottles. You have several options – you can use a bottle or a jar, you can choose from vegetable oil or baby oil. I have tried both and personally I prefer the baby oil because it is clear. Place some sand in the bottom of the bottle or jar. Fill it about halfway with water. Add a drop of blue food coloring (add more until desired color is reached). Drop in your seashells. Add the oil, leaving a little room at the top for air. Hot glue the cap on the bottle or the lid on the jar. Lay it on its side or gently rock it back and forth and watch the waves go back and forth. What happens to the sand and the shells when you shake it up?